Informal poll! 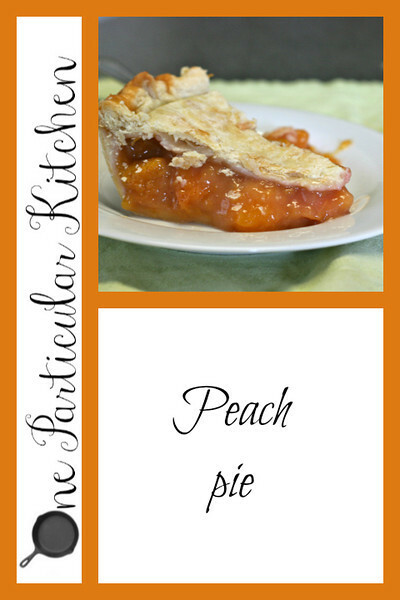 How do you like your peach pie? Plain? With ice cream? With whipped cream? My Grandpa used to top his apple pie with half a slice of American cheese; I was never sure how I felt about that. What’s your vote for peach pie? I’m going to be the weirdo. I don’t like peach pie! I have no idea why, but I hate hot peaches. So no peach pie, no peach cobbler. Any other fruit I’m fine, but not peaches. My grandmother did the slice of cheese on apple pie, too. I have yet to try it. Berry cobbler or apple pie…definitely needs a scoop of good vanilla! WEIRDO!! No, I get that; we all have our things. I don’t like SEEDS! That’s weird. I’ve never heard of anyone else doing the cheese on apple pie! I love it! I love fresh peaches! I love making peach cobbler with fresh peaches this time of year. And I can’t wait for it to cool either, so I always top with vanilla ice cream! Yes! I made a cobbler yesterday! i’m actually with Leah – i don’t like hot peaches. i don’t like cooked apples either unless there’s a bit of crunch still to them. but i LOVE fresh peaches & cold peaches. i’m a bit fan of vanilla ice cream over sliced fresh peaches, topped with a little brown sugar granola. so maybe that would work on the pie, too? I absolutely love the idea of the slice of cheese on the pie! I’ve had a recipe saved for an apple pie with cheddar crust for ages. Must make soon! But as for my personal experience, any kind of pie a la mode is the way to go! Ooh a cheddar crust! I definitely want to hear about that. I recall an Andy Griffith show where Andy asks Aunt Bee for a slice of cheese on his apple pie. Peach pie with ice cream, yes! In a pinch, I’ve poured cold evaporated milk (not condensed!) on the pie instead. With French vanilla ice cream, of course! That cheese thing makes me gag. Well notice I didn’t say _I_ had tried the cheese thing….